The last four words of Gilmore Girls were perfect. There was only one satisfying way the show could end. This was it. When Gilmore Girls creator Amy Sherman-Palladino left the show in 2006, she cast something of a curse on its seventh season, for which she wouldn’t be returning, by telling TV Guide that she had had the series’ last scene planned, down to the final four words. From that moment on, the seventh season was doomed by the idea that there was a “correct” ending to the series, and that the one Sherman-Palladino’s replacement David S. Rosenthal penned, while perfectly adequate, wasn’t it. The #final4words became something of a legend, a scrap to cling to when the actual finale wasn’t as satisfying as fans had hoped it would be. So when it was announced that Netflix was reviving the beloved series, with Sherman-Palladino herself at the helm, the knowledge that the four words would finally be revealed caused a frantic guessing game to begin. With expectations that high, the last words—regardless of what they actually were—were destined to disappoint. No ending could possibly live up to that kind of hype, and simply concluding the show with a pop culture reference (“We’ll always have Paris” would’ve been appropriate) or something achingly sentimental (“Let’s go to Luke’s”) would have let fans wipe their tears, clean up the mountain of takeout boxes at their feet, and wrap up a pop culture era with a charming but utterly forgettable finale. And for a while, watching the revival, it felt like the show would go that way. But it didn’t, because Sherman-Palladino decided to drop a bombshell instead. Immediately after the words are uttered, the scene cuts to black, Sopranos-style, and the viewer is left looking at their own shocked reflection in their screen, because that’s precisely what this ending is—a shock. A journey 16 years in the making ends on cliffhanger, and not only that, but we’ve been tricked, because the last four words aren’t really four words at all, they’re two. Suddenly, Sherman-Palladino’s fretting over whether the scene might be underwhelming seems like a fakeout of laughable proportions. It isn’t as though we were left completely unprepared for the bombshell; the revival’s marketing campaign was littered with clues, including a much-buzzed-about Instagram photo that featured a single apple atop a plate of Pop Tarts, seemingly a callback to a Season 5 episode of the original show, in which junk food queen Lorelai attributes her fruit cravings to possibly being pregnant. It’s just that, despite the fact that Lorelai is around 50 by the time of the revival, it always seemed far more likely that she would be the pregnant one—in fact, the revival’s first episode, “Winter,” spends an inordinate amount of time setting up that very plotline, as she and longtime beau Luke consider using a surrogate so that they can finally have a child together. When that chance passes, so too does the possibility of a baby on the way. But for the attentive viewer, there are plenty of other pregnancy hints sprinkled throughout A Year in the Life: Paris offhandedly remarks that she missed a period, a chance encounter with Dean reveals that his wife is expecting a daughter, Logan quips about Rory having kids when she’s really just babysitting. It’s a testament to the Palladinos’ ingenuity that somehow, by the time “Fall” rolls around, the possibility of a Gilmore pregnancy has, like Rory’s decidedly unremarkable boyfriend Paul, been all but forgotten, so that when Rory finally says the words, the revelation is legitimately surprising. And yet, was there really ever any other way to end the series? It’s no accident that that last scene is followed almost immediately by Carole King’s “Where You Lead,” the show’s original theme song (and a mother-daughter duet) that had been conspicuously absent from the rest of the revival up to that point. 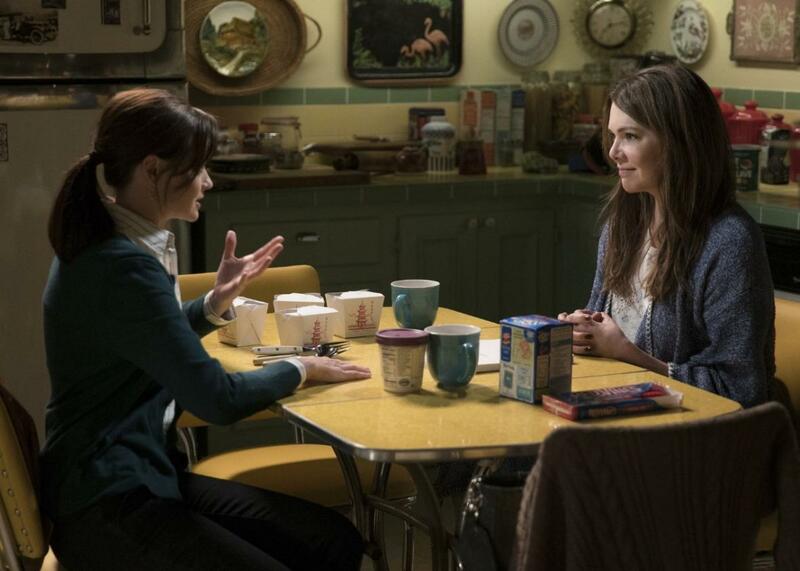 This ending brings the series full-circle: Rory is 32—the same age Lorelai was when the series began—embarking on a new phase in her life, a mother-child relationship in which she’s now the first part of the hyphenate. As Slate’s Willa Paskin has convincingly argued, the final few words have a different meaning today than they would have during the show’s actual seventh season, when Rory was just 23; then, they would have been a sign that Lorelai’s daughter was doomed to repeat her mistakes. But no matter what age, Rory would always have been better equipped for single parenthood than Lorelai, precisely because she had Lorelai for a mother. Lorelai had to find her own way. Rory has someone to fall back on. Lorelai isn’t fated to be a mother again, because she’s a grandmother, filling her own mother’s shoes. Rory’s future is suddenly full of possibilities we hadn’t considered. It’s the perfect ending. Those last four words are definitely a risk. They might make fans cry, or gasp, or fume, or maybe even roll their eyes. But one thing they definitely won’t be is underwhelming.